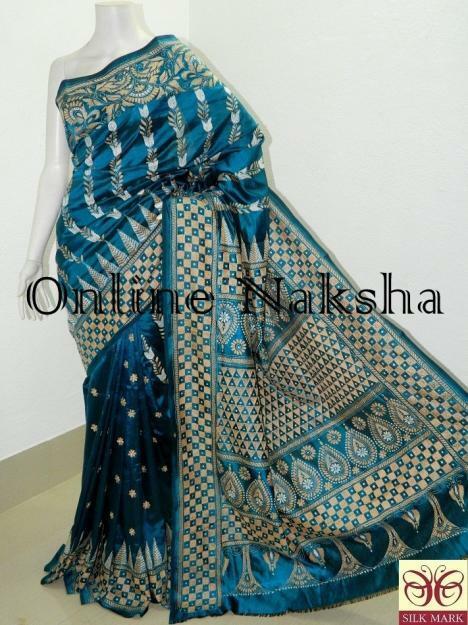 Kantha Work Bangalore Pure Silk Mark Saree by Online Naksha. Look your ethnic best while you reveal in comfort in this traditional yet contemporary Kantha Work Silk Saree. Bangalore Pure Silk used to craft this beautiful saree. And Kantha Work hand embroidery done on it. The pallu of the saree crafted nicely with heavy stitches. Besides broad border makes the saree look gorgeous. Each piece from Online Naksha is elegantly crafted and will surely add grace to your wardrobe. Pair it matching traditional jewelry with the saree to steal the show.